Wilbury Bodyshop, MOT & Service Centre are based in Hitchin with other 50 years’ experience between their highly trained qualified staff. They are proud to say they have some of the best technicians, panel beaters and paint sprayers in the area. They have a growing reputation for providing an honest and reliable service. Aiming not to be the cheapest or most expensive but to provide their customers with a service above and beyond their expectations. Wilbury are VBRA, MICOP and TSI approved and dedicated to achieving the highest level of customer confidence and satisfaction. All your car needs under one roof. Now servicing electric & hybrid vehicles. "Local and friendly with open and honest communication"
"Is the best experience so far from UK. Better than the main dealer. I recomend this garage without a question"
"Honest and reliable garage excellent customer service "
"Always excellent,friendly and professional service"
"A friendly, helpful garage providing a good service at a good price"
I recently had my car MOTed and serviced at Wilbury Bodyshop M O T & Service Centre. The rear brake pads needed replacing and this was carry out on the same day. The garage, which was recommended by a friend, provided a good service at a reasonable price. The staff were friendly and very helpful. I will be using this garage in the future. They put themselves out to find the right level of car service and fitted in the brake replacement on the same day. Friendly service. We have been using this garage for several years for servicing and MOTs and have always come away feeling they had done a good job at a fair price. "Excellent service, advice and price"
I've used the garage once before for my son's car which had issues and they were quick to respond to the problem. Paul gave good advice, when he could have charged extra for more diagnostic work so I had faith in their honesty. Consequently I returned for an MOT/Service with my daughter's car and plan to return with my own. Whilst I was very pleased with my previous garage, who I had used for a number of years, the convenient location of Wilbury Bodyshop and their services to date has encouraged me to change allegiance. For me, its very local and they are particularly accommodating in booking my car in. Love the outside paint too - so easy to find! Paul and his team really went the extra mile for me today. My cars breaks were grinding and it needed sorting fast. But as a Mum of a young baby I was struggling to see how I was going to manage it.... not a problem. Paul’s team came to pick my car up. They then worked really quickly to not only sort my breaks but to fit 3 new tyres as they noted mine were on the point being illegal. When I told Paul I needed my car for work at 4 he didn’t make any promises but he got my car back to me by 2! Amazing service and so helpful! "Excellent customer service with prompt booking and MOT service"
Booked the MOT for the afternoon and it was carried out promptly and honestly at a competitive price. I will definitely use them again and I would recommend them to family and friends. "Great service at reasonable prices with friendly helpful staff." Arrived late for my MOT but it was no issue. Greeted by courteous staff who ensured the MOT was still completed promptly. 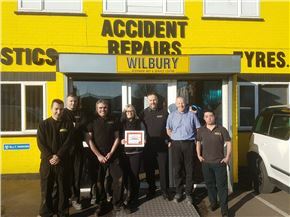 "I've owned a car for 54 years and Wilbury is the best service centre out of the many I've been to." My car is 16 years old and is a family friend. It needed its MOT and a 100,000 mile service. There were several faults as I had been warned about in another service centre the year before. Paul, the manager of Wilbury gave me a clear description of the car's faults, what was needed to remedy them and the exact price. They did a first-class job, and I was offered a view of everything they had done. The car had been cleaned and felt like new when I drove it. I liked everytinng about it! "A warm, friendly welcome, and clearly very good at what they do!" From the initial phone call as a new customer, to arriving at the garage one thing stood out for me: Good, honest, trustworthy, customer service! Being able to book my car in with a 1 hour window for it's MOT was really handy, and when I arrived I was offered a cup of tea. An actual, proper, cup of tea. In a proper mug, made using a proper tea bag! None of the automated coffee machine from the 80s using powdered milk malarkey! They even found the time to put a quote together for some further work on my car (at my request) whilst getting the MOT done. All in all, a very positive experience. Friendly and experienced staff, a warm welcome, and great value for money. Highly recommended. "trustworthy, speedy and lovely staff! " Found staff very friendly and informative, able to diagnose and rectify fault. I have also had to use this garage for bodywork repair, the results from the repair, could not see its been marked in the first place. First class service. Wilbury's have serviced my car for the past 9 years. I wouldn't go anywhere else. Excellent work and price. Always a professional service, which is important to a woman! "Technical, dependable and suits the wallet"
Have used this garage for the past 8 years for mine and the wife's car, recommended to family and friends due to the amount of ear ache that this has saved me over the years. Would not even think about using another garage for bodywork or mechanical . Booked in too garage to have half the engine taken apart to fix a oil leak (main dealer had quoted over 1000 pounds just to remove engine and assess. Garage found the tensioner had come loose, welded metal to make a tool, completed the repair without having to remove engine. Total Estimate to fix fault £868.69 Total Bill £269.22 I would have known no difference if they said they removed engine, very happy with service. congratulations. "Friendly, reliable and competitive on prices." Had a light come on dashboard, got a diagnostic scan done, given a full printed report, then they talked me through the fix, garage suggested they reset the fault for know as it possible the battery going flat put the light on, if reoccurs within next couple weeks they will give a free scan to confirm same fault then have to start investigating. 1 month later still no light on, was expecting a large bill, will certainly be back for a service. I was dubious visiting this garage as I took the offer of MOT £17.50. I expected them to fail it and quote a fortune for repairs. How wrong was I. These guys talked me through the mot and when it passed they explained the certificate and what advisories needex doing before the next MOT. I was pleased with the whole service from the tea offered while I waited to the tour around the garage. These are so transparent they certainly have nothing to hide and not only will I use them again I will recommend them too. Just been to garage had a new part fitted to airbag system, very professional, treated me like a valued customer although this was first time i have used them. "Quality staff, honest, efficient and cheap"
Just waited for my MOT to be done, was made to feel comfortable with a nice cup of tea, then the failure was explained to me in detail ( just couple bulbs), no charge for fitting just paid for the bulbs. Overall a great experience, never thought id be saying that about getting my MOT done. thank you. "Done exactly what they said they would do !" Just had some scuffs repaired on my car, have my wife's car booked in there in a couple weeks, great service. Had a major service done with these guys, picked up my clean car, got a full typed report of the diagnostic test, then got some advisories, they advised me that my brake pipes needed sorting before the mot but couple of the other advisories they told me to leave till the mot and they would check them on the mot. Never been into a garage that have not tried to sell me everything. 10 out of 10. thanks. "Knowledgeable fair price and honest"
Took a long time to find a honest garage, well done. Service and mot, they told me to leave a couple of advisories until next year, could not believe they did not try to sell me the work. Will not go anywhere else now. "Good value garage that offers excellent, honest service"
I have been using this garage for 3 years now, for MOT, servicing and repairs. As a female, I don't feel intimidated using this garage. They explain everything to me and the prices are very reasonable. However, the best thing about them is their service. They go out of their way to make sure things are done properly and to my satisfaction. I have had to use them for a number of repairs to my car recently and everytime I have been happy - they have always been honest about where I can certain work done cheaper elsewhere (e.g new tyres). I completely trust them and have never had them try to get extra money from me by saying something needs doing when it doesn't (which some garages have tried with me in the past!). Whether I am waiting in the waiting room or whether they collect/drop off the car - all the staff are so friendly and nothing is too much trouble for them. Their service exceeds all my expectations and for this reason I have no hesitation in recommending this garage to everyone I know.